You, Me and Movies: Review: The Netflix arm of the Marvel Cinematic Universe evolves with the second season of "Iron Fist"
Review: The Netflix arm of the Marvel Cinematic Universe evolves with the second season of "Iron Fist"
If you have time to do some research, you'll find that the only Netflix Marvel show I didn't review on my website was the first season of "Iron Fist." The reason being I never finished it. I know I had some harsh words for both "The Defenders" mini-series and the first season of "The Punisher," but I guess it should say something that I finished both of those shows. To this day, I have never watched "Iron Fist" all the way through. Why didn't I finish it? Well, for starters, it feels like a shameless rip-off of "Arrow" for anybody who doesn't know comic books. The show didn't even try to differentiate itself in a creative way. 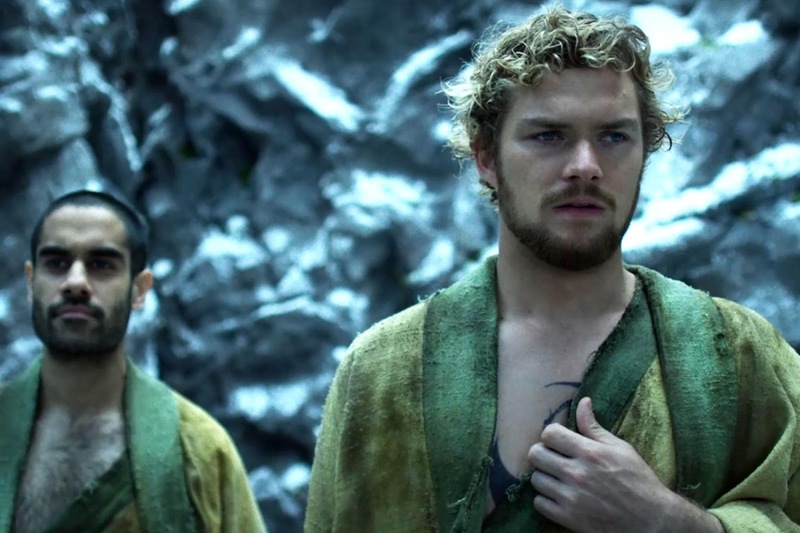 For some reason Finn Jones, who was so good on "Game of Thrones," was sleepwalking through the entire series. Tom Pelphrey was migraine-inducing to watch, and I was convinced he was the worst actor I had ever seen up to that point. "Iron Fist" also featured the worst example of what has plagued all the Marvel shows, they take a two hour story and stretch it across thirteen hours. I couldn't finish the first season because it was so bleeding boring to watch. The show couldn't even produce cool fight scenes, which is a shame for a show whose upbringing is within martial arts. I guess its just because I am die-hard Marvel fan that I decided to dive into the second season of "Iron Fist." Despite not finishing season one and not digging "The Defenders." I guess also that 2018 seems to be a year of Netflix Marvel change. "Luke Cage" season two was really good, "Jessica Jones" season two was pretty good. So I guess that means that "Iron Fist" would be the next to improve, right? The thing is, it feels like somebody is starting to listen to some of the major flaws fans and TV critics are pointing out, because it seems like they are proactive about making better television shows. The second season of "Iron Fist" is only ten episodes, three hours shorter than the first season. They make the most of those ten hours we do get putting together a story that both further develops the characters and story we learned in the first season, but also expands the universe of Iron Fist and presents him with a new challenge. Never does the show feel like its dragging or pandering for no reason, the show keeps moving, which has always been the biggest weakness to these shows. In the post-Defenders world of Iron Fist, Danny Rand is laying low from recent events. He's dating Colleen Wing and they are living together. Joy Meachum is trying to move away from Rand Industries and start her own company, to the dismay of her brother Ward. Davos returns from season one, and we see more of the past him and Danny shared while at K'un L'un, and Davos has a plan for New York City, that involves Danny in a sinister fashion. Plus, Alice Eve joins the main cast as Mary Walker, a mysterious girl from the midwest who has an agenda of her own. Alice Eve is fine addition as Mary, and creates a nice foil for Iron Fist. Tom Pelphrey as Ward is much better this season, and he's got a redemption arc that I found endearing. There is a moment in the middle of the season where Ward has a heart-to-heart with Danny that really brought the characters to a head. I liked Jessica Soup in "The Following," but when she turns evil in this season, I just don't buy it. I don't think she has the range to be a snooty businesswoman, but hey she sure tries. Sacha Dhawan steps up as Davos, and he does really well here. I think fans of the first season will be surprised by how this one concludes. I wish we actually got Danny Rand in his iconic costume. Other than Daredevil, I don't get why these Netflix shows are so afraid of costumes. I bring that up only because I think what makes this season better is that Netflix is getting better embracing the comic book side of things. I thought in earlier seasons of all of their shows, they tried to keep things a little too real. Nevermind that they chose to make shows revolving around a man with enhanced senses, a bullet-proof man, a woman with super strength, and a man who can create an indestructible fist that shines when he focuses hard enough. There is no reason to try to play things too realistic and too grounded. In fact, these shows have been hurt because of that. There is a lot of crazy stuff that happens in this season and I like that they've found the perfect balance between comic book fun and real life situations. It's something I wished we got more of in "The Defenders" and now Netflix may be making up for it. People wondering how this all connects to the bigger picture of the Marvel Cinematic Universe may be disappointed. I've already read online quite a bit that many fans have deduced that the movie side of the franchise is no longer connected to the TV side of the franchise, if they ever were connected in the first place. As the years wear on, it seems the shows are less and less connected to the continuity of the movies. Kevin Feige keeps teasing that paths will cross eventually, but he's been saying that for years. How long is eventually? Jeph Loeb, producer of the Netflix shows, has confirmed that the Netflix stories take place a few years before the current timeline of the movies. So people expecting to see New Yorkers disappearing into dust at the end of this season will be disappointed. It also gives clarity to the timeline of the shows. This is a bigger question to ponder, and I am planning to write a bigger piece about this very subject soon. I will say that Sokovia is dropped a few times in this season. Since Sokovia wasn't a place in the Marvel world until it was introduced in "Avengers: Age of Ultron," then these shows have to be in the greater MCU, right? The bottom line is that the Marvel Netflix shows are slowly learning from their mistakes. And now any season that doesn't have a single episode that feels like its lagging the season is a good one in my book. I can only hope that this means "Daredevil" later in October is going to blow our minds.